Bass player Benny Turner has spent a lifetime holding down the bottom end of the blues. The brother of guitarist Freddie King, Turner has played behind some of blues’ greats and has recently stepped up to the mic as a front man leading his own band. It is hard to believe Missouri native Marquise Knox is still just 26 after being on the scene for a over a decade now. Since making his debut, the guitarist has been schooling with his elders and crafting a sound of his own. Nashville soul singer Charles “Wigg” Walker was part of the often-unheralded blues and soul scene that thrived in the Music City in the 1960s and ’70s. One of the few remaining survivors of that classic era, Walker still performs every week. 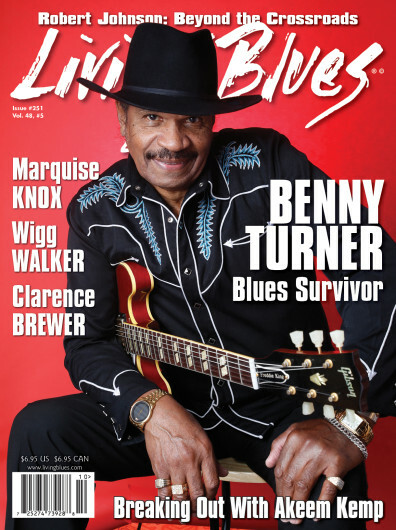 Hailing from the Ozark Mountains, Clarence Brewer isn’t your typical bluesman. Having spent much of his life as a visual artist, Brewer brings a unique perspective to his songwriting. An excerpt from the new book Beyond the Crossroads: The Devil and the Blues Tradition.